Hosted by the National Museum of Australia, the Australian War Memorial, Old Parliament House, Questacon: the National Science and Technology Centre, ScreenSound Australia and the National Gallery of Australia. 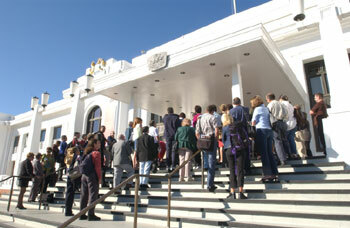 Delegates experienced Australian hospitality at the 2005 International Museum Theatre Alliance Conference, hosted in Canberra, Australia. Over four exciting and engaging days, delegates from the world over shared their knowledge and expertise in the field of museum theatre and performance. These passionate and dedicated professionals discussed their experiences in a variety of cultural institutions and theatre companies, including zoos, art galleries, museums, historic sites and community arts groups. The conference showcased performances, debates, presentations and workshops, inspiring delegates and generating a platform for discussion and the sharing of ideas. It was a unique opportunity to discover the latest trends and research on museum theatre and performance from the far reaches of the world. Australia’s two previous national forums – Raising the Curtain and Spotlight on Performance – explored the diversity of museum theatre in Australia, and examined how theatre can enable museums to connect with new communities, and to give these communities a voice. The previous IMTAL conference in Virginia 2003, Roots to Branches, combined the history and development of museum theatre with contemporary practice. - Provoking: Methods and examples of tackling contemporary and controversial issues in public performance programs. These themes were given as a guideline to help focus the conference. Check out IMTAL-Australasia HERE or visit the National Museum of Australia's website www.nma.gov.au to learn about the newly formed IMTAL-Australasia network and its activities.